We interrupt Annie’s (not-so-)regularly scheduled blog posts to bring you a special message from her friends Juliette, Dani, and Val. This is a blog hijacking! Do you know Annie Parsons? If you do – then you love Annie Parsons. There’s no two ways about it. And if you love Annie Parsons, you are probably aware that she is embarking on the trek of a lifetime in a little less than a week. You can read more about it here. Annie will be offline for the majority of her trip, but what if – as her friends and fans – we utilize the few moments that she IS online to flood her with encouragement and joy and remind her that she has a whole team of people thinking of her and praying for her throughout her adventure? 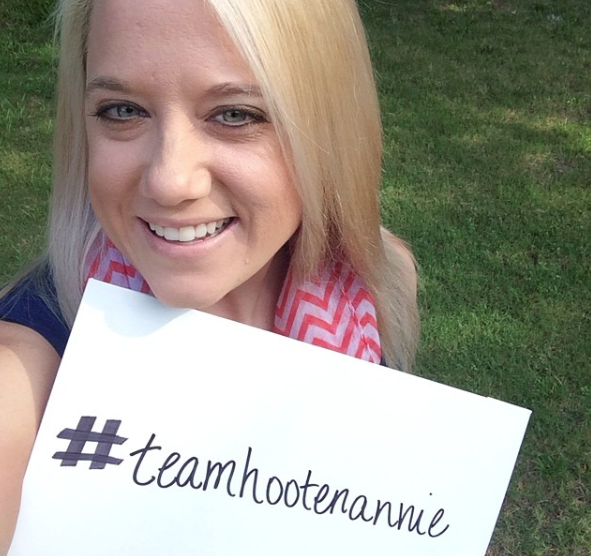 If you would like to be a part of this movement, simply post a photo, video or message to Twitter or Instagram and hashtag it #teamhootenannie . (You can also tag her on Instagram, @hootenannie, if you’d like – but she’s not on Twitter.) Feel free to leave messages/images/video clips for her as frequently as you’d like. That’s it! Have fun, and welcome to Team Hootenannie.